The three Wasilla men planned their Prince William Sound deer hunt as a day trip. So friends and family were scared and nervous as that single day stretched to two, then three, then into a fourth, with 12-foot waves and gale-force winds hampering a search led by the U.S. Coast Guard. "When I heard a 20-foot boat and looked at the buoys and looked at the forecast — unless they managed to get to the beach somehow, it's not something you'd expect a lot of good results from," said Matt Kopec, a hunting and fishing guide with two decades of experience in the Sound. Unbeknownst to the searchers, however, the men were fine. Or, as fine as they could be while holed up in a cabin on remote Chenega Island, without cell phone service or knowledge of when the weather would calm enough for them to return home. "We slept, we prayed. And we ate some kelp," said George Matveev, 35. "We never even ate our food because we didn't know how long it was going to take." He added: "At one point I was starting to think, it's going to be a couple of weeks — they're going to quit looking for us. Everything crossed our minds, at night especially." Matveev was the only one with a sleeping bag. The cabin had an oil heater but his two companions — brothers Sam Tipikin, 39, and Leo Tipikin, 37 — slept in their boots. After three nights, a Coast Guard helicopter on New Year's Day plucked Matveev and Leo Tipikin from their temporary home, then flew a few miles away to pick up Sam Tipikin, who was out for a hike in search of cell phone service. By the evening, the three men were sharing a Seward hotel room, waiting for a ride home. And their friends and family members were shutting down a far-reaching social media campaign they'd mustered to help with the search — including a fundraising effort that netted more than $10,000. "The hardest part was not knowing, but still putting in every single effort and sweat into trying to piece in details for the search," one friend, Zack Kasachev, wrote in a message. "We are all wearing a happy face now, with tears of joy." "A really big piece of water"
Matveev and the Tipikins all work construction. They hunt moose in the Valley, they've commercial fished and they're all comfortable on the water, Matveev said. They left Friday from Whittier, 60 miles southeast of Anchorage, and planned to be back that night before a big winter storm blew in. It was the third-to-last day of deer season, and the men were headed to Montague Island, a 60-mile boat ride from Whittier. Hunting there can get easier deeper into the winter, since the snow can push deer down from the mountains. But that snow also comes with lower temperatures and less daylight, said Kopec, the hunting and fishing guide. He stops running his 30-foot boats after October. "I shut down November 1 for a reason," he said. "It turns into a really, really big piece of water this time of year." When they landed at the island, the hunters bumped up on a rock, damaging both their engine and the steering wheel, Matveev said. They beached the boat and fixed the steering, but on the return trip, Matveev said, they were burning fuel at triple their previous rate. It was getting dark and the weather was worsening. So instead of trying to make it back to Whittier, they started looking for a place to wait things out. "We just didn't want to risk it," Matveev said. "You have one chance." "Like it's meant to be"
The men had downloaded maps and saw they were near markings for an abandoned village on Chenega Island, which is where they found the cabin. There were three bunk beds, "like it's meant to be," Matveev said. They spent the next two days there, using the heater to stay warm and relying on candles and water that were left in the cabin. Matveev said the men planned to find the owners and pay them back. "We really give thanks to the people of Chenega, because we probably would have died without the cabin. It was raining, snowing, sleet," he said. The men all stayed positive and didn't get scared, Matveev said, though he added that he cried a lot knowing that his family and five kids would be worried about him. 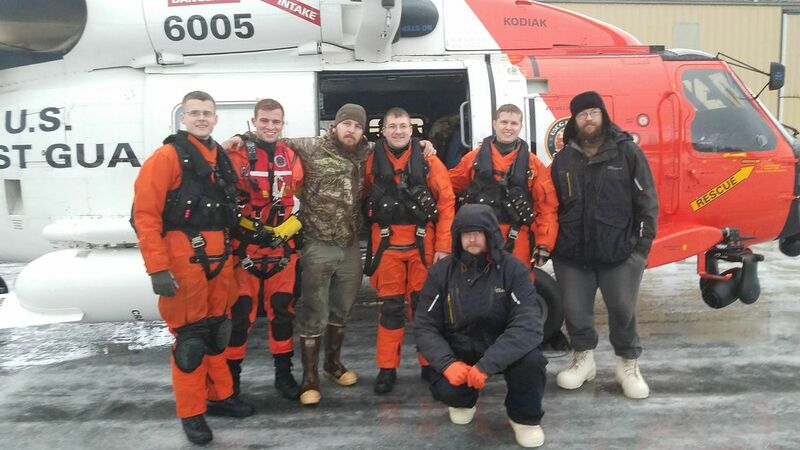 While the men waited, the Coast Guard had started a search. They learned the hunters were overdue late Friday from the wife of one of the men, said spokesman Jon-Paul Rios. Over the next three days, Rios said, the Coast Guard searched 1,600 square miles, with two different crews switching in and out of the helicopter to maximize its use. A medium-sized Coast Guard boat based in Valdez also spent 10 hours "getting knocked around," Rios said, while a 110-foot cutter, facing 20-foot seas, had to turn back. Friends and family of the men had also mobilized. In social media postings shared hundreds of times, they offered to pay for ferry tickets to shuttle people from Whittier to boats in Cordova, at Prince William Sound's eastern edge. A crowdfunding campaign raised more than $14,000 on New Year's Day alone. Family members contacted at least one charter company in Whittier, Lazy Otter Charters, which helped search Passage Canal, near Whittier, on Monday, said co-owner Kelly Bender. Coast Guard members in the helicopter ultimately spotted the hunters' boat and a flag on the beach nearby. The 21-foot Duckworth Advantage, Matveev said, is still at Chenega Island. As soon as the weather calms down, he said, he'll have somebody help him bring it back.